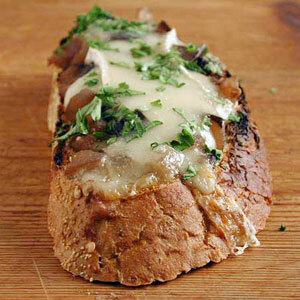 These roasted garlic and brie toast are a simple, delicious appetizer. Place baguette slices on cookie sheet and bake until golden brown, (Approx. Melt butter in a small oven proof skillet over medium heat. Add garlic and toss to coat. Transfer skillet to oven and bake until knife pierces garlic centers easily. (Approximately 20 minutes.) Cool slightly. Peel garlic and transfer to a bowl and mash with a fork. Add brie and cayenne to garlic and mix well. Spread some cheese mixture on each toast. Sprinkle with arugula and serve on a platter. NOTE: You can make the cheese mixture 6 hours ahead, cover, and let stand at room temperature..